On Tuesday we had the pleasure of having Nancy Stevens in the spotlight. She showed us three baskets full of beautiful quilts. I asked her to tell me a little bit about her quilting. "I fell in love with quilts around the time I fell in love with my husband -- his grandmothers were quilters and I was smitten with what I found at their homes. My first quilt was a simple 4-patch for my first baby. About twelve years later a relative took a Quilt In A Day class and taught me to make a log cabin. I've never looked back. I seem to go through periods or phases, i.e., I seem to be done with 30s repros (though they make really great baby quilts) and took a pledge a few years back not to make quilts from a single line of fabric (they are too matchy, matchy for my taste). I don't think I've ever met a basket block that I didn't like and I'm on such intimate terms with William Morris that I call him "Bill." I'll never have enough batiks. 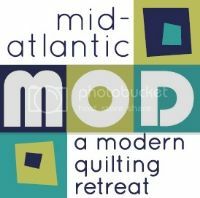 In the past couple of years I've discovered the Kaffe Fassett Collective and have cautiously ventured in... Next up is to get better at machine quilting; I've only just begun to do that." Thank you so much Nancy for sharing your quilting history with us. Your work is beautiful! Check out the slide show below to view Nancy's quilts. And to think that her Home Ec teacher told her that she couldn't sew!